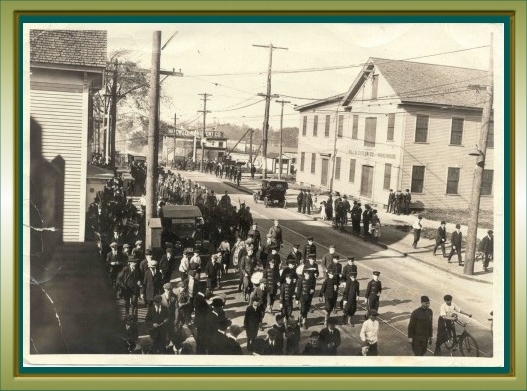 On September 30, 1920 a Military Funeral was held for Sergt. George W. Brick who died in France during the first World War. He was buried in France during the war. His remains were the first of the WWI Veteran's to be re-patrioted in the city of Lowell. A memorial service was held, followed by a parade, and the the remains were buried in at St. Patrick Cemetery in Lowell. The following story is from contemporary newspaper articles, the pictures were supplied by descendants of Sergt. Brick..
Sergt. George Brick, former member of Co. C of the old Sixth regiment, who died from pneumonia while serving with the Fourth pioneer regiment in France, will receive a military funeral in this city Sunday afternoon according to the present plans of Lowell Post of the American Legion, Co. C. Associates, Co. K Associates and the O. M. I. Cadets. His body arrived from overseas yesterday morning and is now lying in the funeral parlors of C. H. Molloy’s Sons from whose establishment burial will take place. Plans for the funeral were formulated last evening at a meeting of Co. C Associates. This was presided over by Maj. James Powers who was a captain in Co. C. Sixth Regt. M. V. M. when Sergt. Brick was in its ranks. The major spoke of the sterling qualities of Sergt. Brick, his keen interest in militia affairs and his first class service with the A. E. F. It was with deep regret that the boys of Co. C learned of the death of their top sergeant. Maj. Powers said and it is only fitting that they should turn out to honor a true soldier. Eli B. Hart reported that Co. K Associates would turn out with Co. C and that a large delegation from the American Legion would also be in line. Rev. Dennis A. Sullivan O. M. I. got in touch with Maj. Power earlier in the evening and said the O. M. I. Cadets would attend the funeral march and would provide their drum corps to furnish fitting music. There will also be a large delegation from the Ladies Auxiliary of the 101st Regiment. All delegations attending the funeral are requested to report a Legion headquarters not later than 2 o’clock Sunday afternoon as the funeral will leave C. H. Molloy’s rooms at 2:30 0’clock sharp. The O. M. I. Cadets will meet in their own armory in High Street. The funeral of Sergt. George W. Brick whose body was returned from overseas the latter part of the week, took place Sunday afternoon from the rooms of Undertakers C. H. Molloy’s Sons in Market street. It was conducted in a military manner and was most impressive, various soldier and sailor veterans organizations as well as a large circle of relatives and friends being in attendance. Maj. James Powers had charge of the military formations. 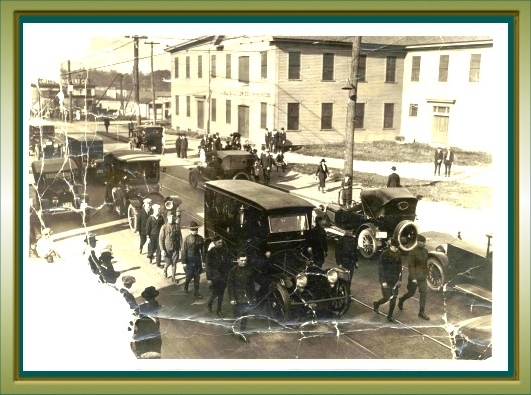 The funeral procession left the undertaking rooms promptly at 2:30 o’clock and at the head of the line was the O. M. I. Cadet Corps under command of Lieut. Brennan. It was escorted by its drum corps. Sergt. Brick was formerly a cadet. Following the cadets were members of the Lowell Post of the American Legions, members of Co. C of the old Sixth regiment, veterans’ of the U. S. navy and other veterans who have no club connections. The following are the delegations which were in line: 101st Ladies Auxiliary, Mrs. William H. Merritt, Mrs. George Underwood, Miss Catherine McCaffrey, and Miss Mollie O’Sullivan; Loyal Order of Moose. Edward Mailoux, Edgar Mailoux, Frank Hennessy, William F. Booth, George R. Ellis and Ernest Parsons; Co. C Associates, Lieut. Daniel Brennan, Lieut. Robert Ginivan, Lieut. William McShane, Sergt. Paul Spilliane, Daniel Coakley, Joseph Willett, Arthur Berard, John Lawless and James Riley. The pall bearers who marched at each side of the hearse were: Lieut. George D. Crowell, Sergt. Ambrose Ready, Edward Earley, John Sullivan, Michael Thynne and naval veterans, William Demarest, Arthur Moran, Thomas Burke, John McPadden and John Scholes. The firing squad was under the direction of Sergt. Eli B. Hart and was composed of the following: Daniel F. Sullivan, Leo R. Pope, John F. Hafey, Joseph P Brassilli, Joseph H. McShane, John Gormley, Frank Mullen, Ernest Brown and Buglers Joseph Mahan, Frank Merritt and William Caril. Burial was in St. Patrick’s cemetery where the burial service was read by Rev. William W. Noonan, O. M. I. “Taps” was sounded by the buglers, and the firing squad fired three volleys as the parting military salute over the soldiers grave. Undertaker C. H. Molloy’s Sons had charge of the funeral arrangements.